People Soup by Ross McIntosh: Boost those Goals! As we edge into February it set me thinking about goals and New Year's resolutions. It seems as though it's a tradition as commonplace as sprouts and holly to make resolutions at New Year. There can also be an associated ironic attitude, perhaps an expectation, that failure will rapidly follow. For example, take gym membership, some sources say that 80% of the New Year's Resolution crowd drops off by the second week of February. Now I'm not a gym member but it's a good example to illustrate my point. In my experience of our society, culture and workplace we're very goals driven. Now I'm not suggesting we should entirely ditch goals but I am proposing that we can loosen their grip on us. Why? In a nutshell - for me, a goal can imply a deficit. For example, consider the goal "I want to be X by time Y" or to make it more concrete "I want to be fitter by June 2017 and will go to the gym three times a week." The trouble for me with such a goal is that X is something we currently are not (or do not have). and "what were you thinking, you know the gym isn't for you". These thoughts can be quite dominant and drive our behaviour (or inertia) potentially causing us to give up, sometimes until 31 December 2017. My proposition is to consider an alternative, your personal values. Your values can work on their own or in tandem with your goals. We could use it as a focus for what's important to us and something that reflects the qualities we would like to express in our behaviour. We can also choose to adopt a value right now, there's no implied deficit and no need to wait. 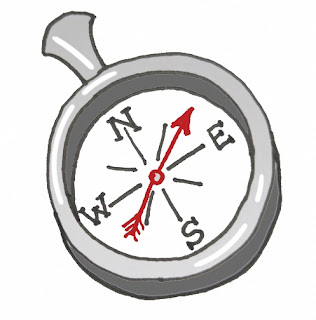 In psychological skills training we often compare using values as a guide to using a compass to navigate. We use a compass when we're looking for a direction or when we are lost. We decide on the direction that is important to us and then, each step we take is guided by that compass point. That's what it's like using values as a guide for our behaviour. We can also set milestones (or goals!) along the way and record our progress. Importantly, when we veer from the path and perhaps miss a session at the gym we can acknowledge those unhelpful thoughts produced by our mind and not criticise ourselves further. Instead we can choose to recommit to our values. It takes practice but the evidence shows us that using values as a guide for our action can be highly effective. Finding the meaning behind our goals by defining our values can ignite our sense of purpose and provide a compelling focus for our actions.